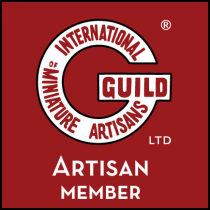 * 1 CHILD'S COLLECTION : Miniature Wicker Furniture and Wicker Baskets by Uncle Ciggie's Miniatures, Uncle Ciggie's Miniature Wicker Furniture and Wicker Baskets are meticulously handcrafted in One Inch, Half Inch, and Quarter Inch Scale for miniature collectors and dollhouse miniature enthusiast. This category is ONE INCH SCALE. The Children's Wicker category includes baby and children's furnishings, along with pull toys. The Toy Wagon is 1 1/2" high x 1 5/8" wide. Fill this with toys to complete the child's room. This Porch Chair is designed for the Nursery by adding French Lace, Silk ribbon bows and roses. The Porch Style Nursery Rocking Chair is also nice in the Baby's Room. The pillow has French lace, silk ribbon and silk ribbon roses.